Guests can eat like the kings and queens as the names of these two restaurants are Maharajah Restaurant & Maharani Restaurant. The Palace on Wheels has two royal onboard dining cars with spacious seating arrangement so guests feel free and there is sufficient place while guests are being served by traditionally dressed staff. The restaurants serve delicious and sumptuous food in all types of cuisine be it traditional or continental. Guests may also opt for traditional food that is offered in great variety including Non – Veg and Vegetarian Meals. 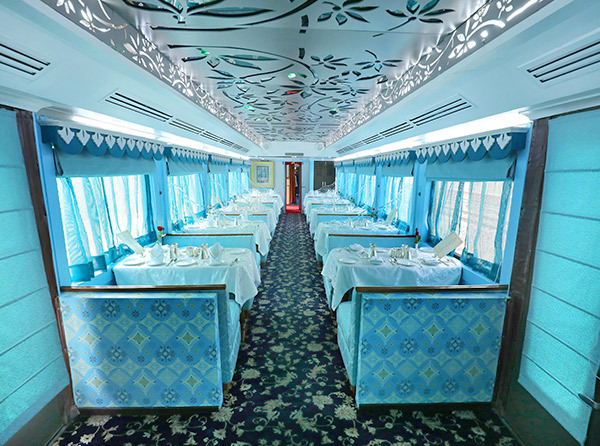 This lavish dining car called ‘Maharajah’ is true to its name and the goal of the Palace on Wheels luxury train. It means ‘Great King’ and the guests can relish food like a King. 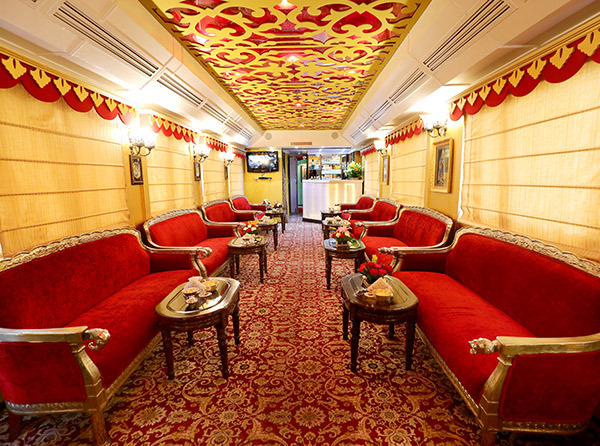 The walls and the ceiling as well as the flooring of the train reflect regal ambiance. This is seen in the furnishings & decor and fine carved furniture which is done up in a royal way. This is the second or another lavish dining car on the Palace on Wheels that means ‘Great Queen’. As the train is about giving the guest a taste of King’s lifestyle, it is named and also shows such opulence in the interiors. Its royal fabric with ancient prints and side - wall mounted lampshades give an olden look inside this restaurant. The guests feel royal eating tasty meals in traditional style within the ambiance of a deluxe 5-star hotel. Each of these onboard dining cars have a similar seating arrangement. There is a dining table for two – those who like a quiet meal or enjoy a romantic time together and the four – seater dining space. Here, there are four chairs for the table. This is ideal for the guest who would like to have a hearty talk with each other over the delicious meal. Both restaurants have panoramic windows by the table on both sides. This makes sure all the guests seated in both dining cars enjoy the breathtaking views of the scenic landscape while relishing their meals. Palace on Wheels focuses on providing a star hotel styled service to all its travelers, in every aspect of the journey, including dining. The train holds two different restaurants at each end of the train. The decor of the restaurant varies, however, other elements of the restaurants remain the same. The food served in the restaurants are freshly cooked. The ingredients for the day are procured on the day before or at the destination. You can find multi-cuisine menu here, including traditional Indian cuisine, which changes with the destination. For instance, while at Agra, you would be served Mughal styled cuisine and while at Alwar, you would be served Mewar cuisine and so on. The train keeps moving as you dine. The soft drinks and alcohol beverages are not included in your tariff. However, hot beverages are included. Top cuisines covered in the menu are Indian, Chinese and Western. Top breakfast items of POW are eggs, toast, pastries, eggs, Indian breads, yogurt, fruit platter, fresh juice, coffee or tea. Lunch and dinner items include Indian and Continental dishes, based on the destination. Tea and coffee are served in the cabin but the food has to be taken only at the restaurant. You can find many traditional Indian sweets in the menu. A typical meal at POW contain, a soup, four to five dishes in each cuisine, Indian bread, pickle, chutney and papad as servings and ice cream or traditional sweet as dessert followed by hot beverage of choice. The train focuses on providing an array of dishes for you to enjoy the cuisine of the land. It is more than just meal, it is a reflection of the culture of the land, at each destination. From time to time, chef might present you with specialty dishes based on procurement of any rare ingredients at the destination. The cuisine, list of food and specialties changes from time to time.